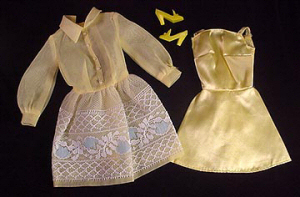 The underdress is a sleeveless yellow satin slip. 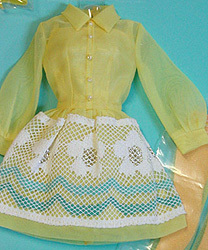 The overdress is a yellow organza shirtwaist dress with an lace covered skirt. There are two different variations of the dress - the lace design is different - both variations are pictured. This ensemble is hard to find and when found can have problems with the delicate organza of the dress.